Google has reportedly yanked an app masquerading as Siri, Apple's voice command personal assistant software, from the Android marketplace. The move comes amid a deluge of Siri wannabes that have invaded the Android market since Apple introduced the iPhone 4S and its innovative features. An app called Siri for Android, made by an outfit called Official Software, appeared in the Android market on Friday and was pulled from the bazaar by Google just hours after its arrival there, according to a report by The Next Web. Also, all other apps by Official Software disappeared from the market, as it appears that Google has pulled the software maker's account, which allows it to sell programs at the outlet. The software company did a number of dubious things that appear to have prompted Google to act against the firm. 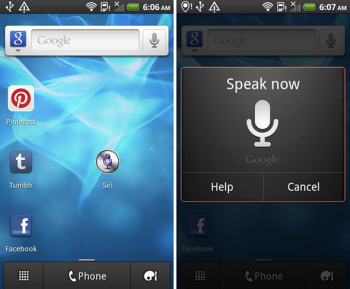 For example, it used Apple's Siri icon for the Official Software Android app. The word "official" was used in a way to make the app look like it was a true clone of the Apple app. When the Siri icon was tapped, all Official Software's app did was load Google's own voice command software, Voice Actions. This isn't the first time something like this has happened. A French developer has even found a way to tap into Apple's servers to enable software running on other mobile phone platforms to duplicate Siri's feats, although the legality of such a move would be doubtful. A search for "Siri" on the Android Market by PCWorld revealed 131 hits, but less than a handful of the programs had more than 10,000 downloads. They were Vlingo Virtual Assistant (32,328 downloads), Iris (20,309), Skyvi (19,444) and Speaktoit Assistant (11,600). While the Android world has been laboring hard to emulate Siri's functionality since Apple pulled the wraps off it, it hasn't quite made it there yet, according to PC World's Ed Albro. "I've concluded that you can find decent virtual help on an Android phone, but the assistants available likely won't be as smooth and capable as Siri," he wrote. He described Siri as the classic executive secretary -- "always well-dressed and possessed of an elephant's memory and a dry wit."